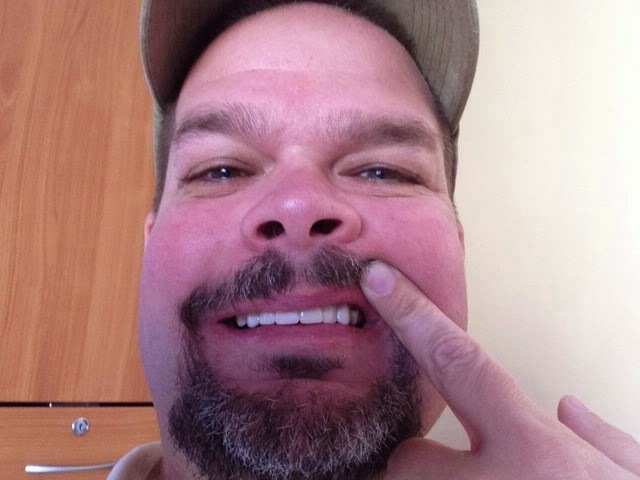 The Dental Tourist: 17: THE INCREDIBLY AMAZING MYSTERY OF THE 7th IMPLANT! 17: THE INCREDIBLY AMAZING MYSTERY OF THE 7th IMPLANT! 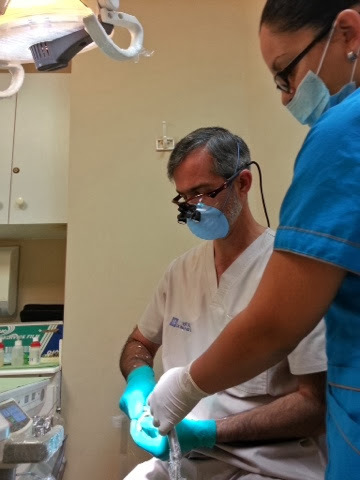 Today I had my first post-op appointment with Dr. Prada (Prosthodontist) since getting 11 extractions and 6....make that 7 implants by Dr. Gonzalez (Periodontist). If you remember from my last post, I left that last procedure with no temporary teeth since it was decided to leave things alone in order to heal better. So I arrived at today's appointment hoping I would get some teeth. That is the whole idea behind this little adventure, right? Also, if you remember, it was decided that I would get 6 implants but when I checked my mouth the morning after surgery I had 7, and wasn't quite sure why. But as I said before I trusted my doctors and figured there had to be a good reason for them to add the extra one. Well, I found out today what that reason was, but you'll have to wait until the end of this entry to find out. Isn't that mean of me? My appointment was for 8:30 today and Carlos, the best cab driver in the universe, got me there at 8:15. While waiting I talked with a gentleman who was also seeing Dr. Prada today. Turns out our paths are very similar. He needed extensive dental work done but it was just too much $ in the states. Someone told him to check out Costa Rica, he did his research and wham bam here he is. He is a nice older guy who resides in San Jose, CA and works in the Santa Cruz, CA area which is the town where I was born and raised. Small world indeed. He had extractions and implants just like I did and in fact was in the recovery room when I was just going under with the help of an IV injecting me with magic juice. I told him about this blog, so if you're reading this Mr. San Jose (I forgot to ask his name), I hope all is still going well with your treatment. Dr. Prada seems to be a perfectionist, which is great in my book. 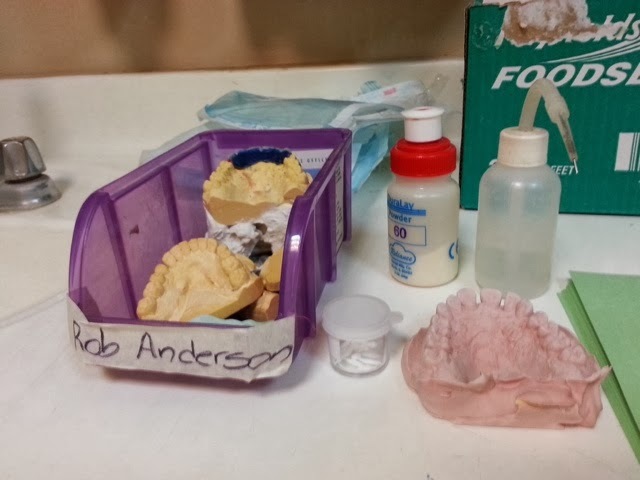 He spent a great deal of time shaping the prosthesis in order to get a perfect fit and bite. He would attach it to the posts, ask me to bite down, open, bite down, open, then take it out and resume the shaping process. He must have done this over 20 times for at least half an hour. I was so happy that he was taking the time to get it right even though I would only have this set of teeth until next week. That's right...I will get a new and improved temporary prosthesis next week. He wants me to take the next four days to try these out and make any notes of what I want changed. Longer, shorter, wider, more white etc. 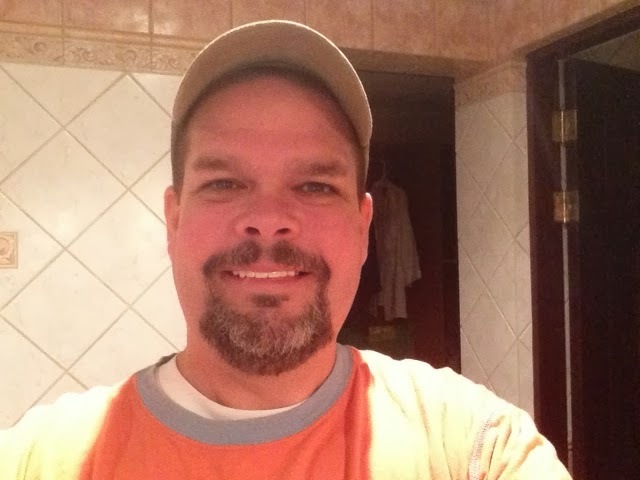 I will then go in on Tuesday and he will make the new prosthesis accordingly and that one will be the one that I'll have until I come back for my 2nd and final trip to Costa Rica to get my permanent teeth. He said we would be able to improve the final teeth even further due to the abutments being custom made. I also need to work on my smile muscles. I'm so use to keeping my lips closed when smiling as to not freak people out with my nasty teeth. I was always conscious of this and it was a huge hit on my confidence. I've taken several photos of my new smile already and it looks forced because I'm just not use to showing teeth. I will get it though, with time. It's going to be so nice to have temp teeth for a number of months in order to see what I want changed when it's time to make my permanents. Too wide, too short, not white enough? No problem...we will get it right. Dr. Prada said, "You heal beautifully", when he was shaping the posts. He even went ahead and took some of the stitches out after being in there for only 2 days. I've always healed fast so I'm glad that continues to be true in my ripe old age of 45 (46 on Sunday!). The 7th implant: So during the installation of the 6 implants, one was not as secure as the other 5. It's not that it was loose, just not secure enough to have the temp prosthesis fixed to it as planned. Some people can get a fixed temporary arch fasten to newly installed implants if there is enough bone and the implants are in solid from the get go. But a lot of time this is not the case and for better osseointegration (implant fusing to bone) the implants can't be loaded so that is when you have to use a regular, removable denture. Then after a number of months when the implants are solid that person can get a fixed device. So anyway after seeing that one of the implants was not as secure as the others, Dr. Prada asked Dr. Gonzalez to put in a 7th implant thus allowing me to get my temp teeth today fixed to my implants instead of a removable denture. But that's not the final part of this story. When Dr. Prada was explaining to me today why they gave me a 7th implant he said that since this was not something that I was expecting that they would only charge me for the cost of material. So instead of paying $800 for the extra implant, it would only be $200. I'm looking in the mirror all the time now. I'm practicing my smile and trying my best for it to not look forced. It will take some time but what a nice thing to have to work on. Wow! Congrat's on having everything go so wonderfully. Seems you hardly even had swelling. The temporary temps look great... very natural. Enjoy practicing your smile. Had just a little bit of swelling this morning. Still no pain or discomfort. Not bad for temp teeth right? I already see a couple of changes I want made so I'm glad I'll have that option next week. Did you get the bottoms too? 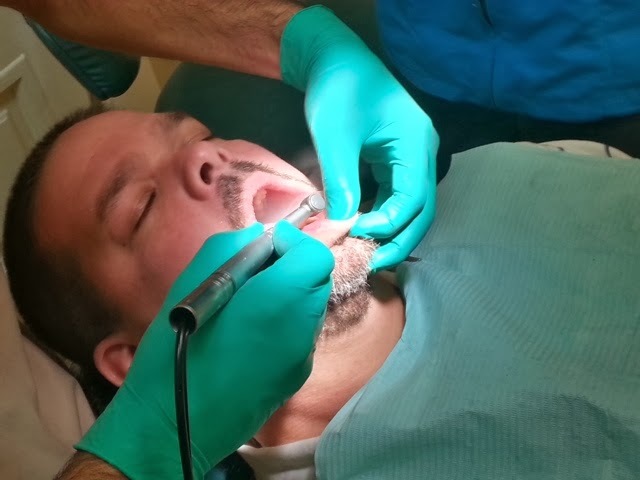 During the implant surgery Dr. Gonzalez did gum surgery on the lower jaw and deep scaling/cleaning. They believe most, if not all, of my bottom teeth are not beyond saving. Also Dr. Prada grinder down a few front bottom teeth that stuck up too far and it helped the appearance quite a bit. I am glad that you are doing well. You look great. Thank you TG! I'm still amazed by all of this. It's been great. Does the Dr use a machine to check proportions for correct symmetry. Some Dr's check for perfect bite alignment, and perfect face alignment. I know exactly what you're talking about. 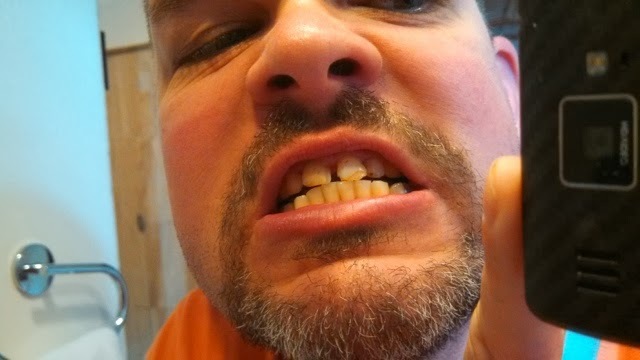 But for this set of temp teeth, which I'll have only until next week, he didn't do that. Now I know for sure he does for the final prosthesis but for my 2nd set of temps I don't know. I'm glad you brought that up as I'll now bring it up with him. Does the implants feel foreign to you now that you have teeth on them? Did he address your molars yet, or is he not doing anything with them? Are the bottoms being done too? The only thing that feels foreign is the temp prosthesis. I can't tell the difference between the new implants and my old teeth roots so that's good. The upper four molars were determined to be healthy and thus were kept. Since you can't see them when I smile I'm not sure if there is a reason to crown them in order to make them look similar to the new teeth. 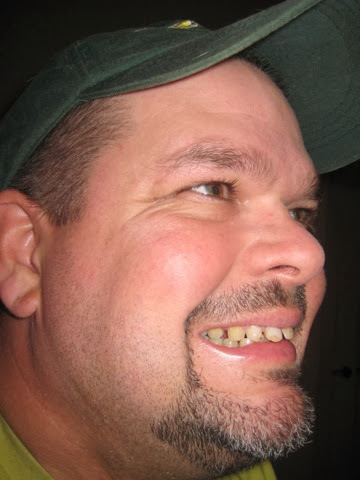 Although now that I think of it I do believe something was said about the possibility of crowning those teeth when I would come back for my final prosthesis in 6 months. I'll ask about that Tuesday. Thank you. Oh and see my above response to another comment for you answer about the bottom teeth. Thanks for viewing my blog! This temp is cemented to the metal posts which are screwed into the implant. This temp will come off next week and a new, improved one will be cemented on. I hear that the cement process is pretty dang reliable and should hold with no problems. 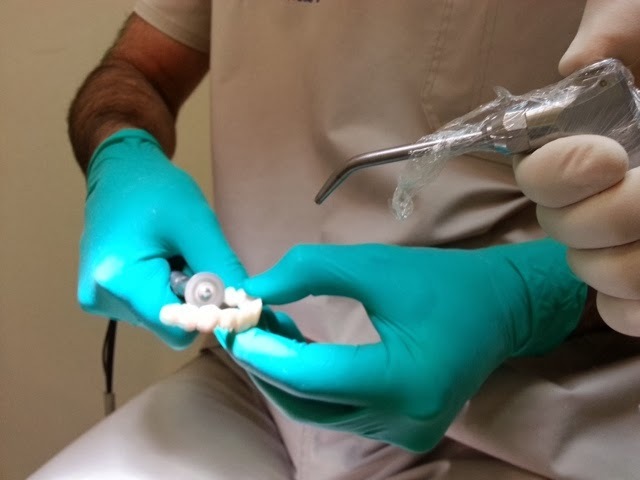 In fact to remove a cemented prosthesis I believe, and I could be wrong here, they have to apply some kind of anti-cement type of solution which dissolves the cement. I think I remember reading that somewhere. 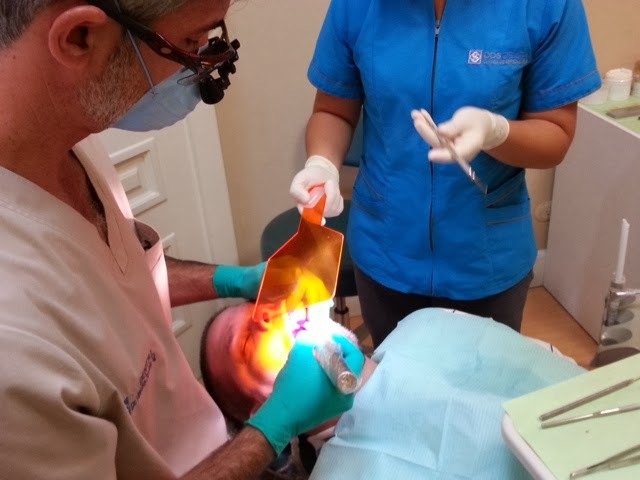 We decided not to stay at the Tryp Hotel and instead stay at a place closer to the DDS Dental clinic. We found a great place to rent on Airbnb.com and it's cheap as well. I've already found a couple of things I want changed for my 2nd set of temp teeth. I think they should be a tad longer and a tad more narrow at the two front uppers. It's great that I get to test a set out for a few days in order to make changes before going home. Rod...I concur. You need to show those puppies! Two front a little Narrower, and longer for sure, in my humble opinion. Can you widen the sides towards the back...I always wondered if they could do that. I want to see a lot of teeth, not hollow space towards the sides of my mouth when smiling. But, that's me! Did you show him the shape you liked from your research you did? Or, did you let the Dr. advise you, as he is the ultimate expert. Just food for thought....I got a PM today from a past CR patient, (didn't mention who his dentist was), and he is not at all happy. He advised me, that he knew what he liked (with both the shape and color), and then he let the Dr. and staff tell him he looked better with xyz, and he regrets it immensely. It's ultimately YOU, who has to live with them, hopefully with no regrets, so listen to your own instinct on this one. I am coming with pictures, and the "LVI Catalog", with a few shapes I like. Hopefully, it will be doable. I've taking note of this for some time.... I know, pictures vs. the mirror issue; We see ourselves in the mirror, but it is opposite of how others see us, it's reversed...Pictures, are how we really look to others. I know.... I have been parting my hair the wrong way (looks wise) for years...lol.... Looks much better to others now, however not so much in the mirror. Can't win. Have you ever watched a show, and certain frames get shown backwards thru out. One minute their hair is one way, and the next it's opposite. They have spliced the frames with some reversed. I've noticed this for years. There is always one way that compliments the person more than the other. Selfies....Say a lot! I have a bunch of photos of smiles I like and even ones I don't saved in my Dropbox folder. I've already sent a few of them to Dr. Prada. The thing is there is only so much they can do with provisionals. 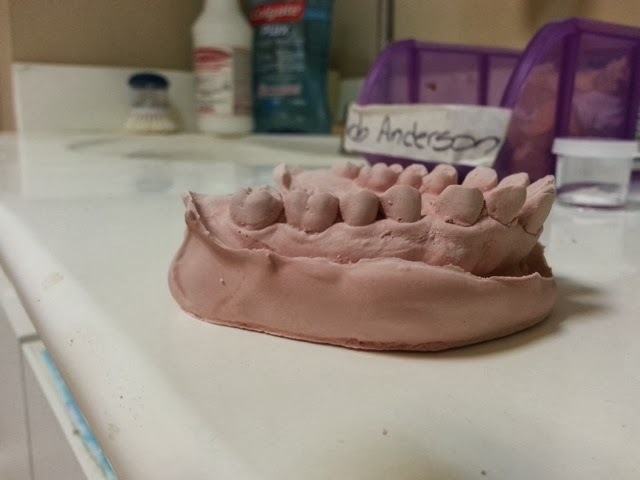 So I'm not too worried about getting it perfect, or as close to perfect as possible, until it's time to come back to CR and get my final teeth. But it is nice to be able to change a few things around from provisional 1 to provisional 2 in order to see what works best with my face. I've researched so much about sizes and shapes of teeth....and color of course. 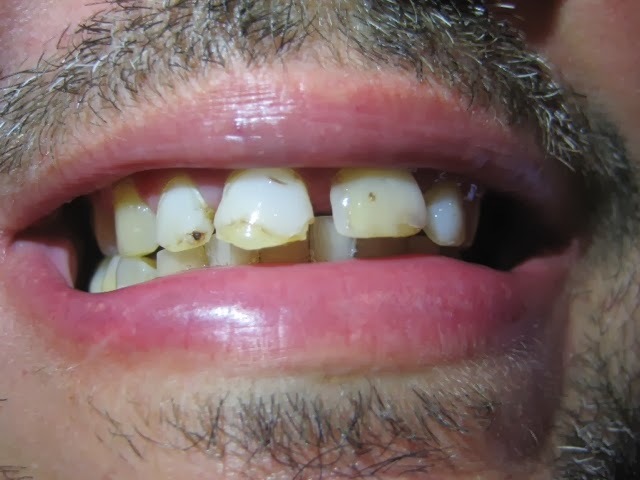 There is some believe by some dentists that rounded teeth are more feminine and squared teeth more masculine. I think it's bull though. After hearing that I started paying attention to the shapes of teeth among the two sexes and there are masculine men with rounded teeth and beautiful women with squared teeth.